Finance Minister Arun Jaitley ruled out any surprises in the tax rates in the Goods and Services Tax (GST) that is proposed to be rolled out on July 1 and also asserted that there will be no cascading in goods and commodities, which can even see tax rates coming down a little. "Officers are working on rate fixation. No surprise because we have said that in the first round rather than take anyone by surprise, you take the existing level of taxation and fit them closest to the bracket. "My impression is that in goods and commodities, there will be no cascading. So it will come down a little. Service tax will increase a little. That's a balancing act that will have to be done so that the quantum of taxes remains the same," he told NDTV. 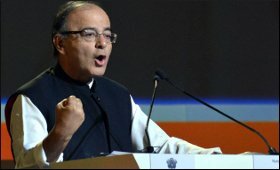 Jaitley, who is in Yokohama to attend the Asian Development Bank's meeting, hoped that the GST would roll-out as scheduled by July 1. "July looks likely because state after state is approving State GST. By the end of May all state laws approval looks likely." He said the GST Council would be meeting on May 18-19. "The state laws would have been approved, the constitutional amendment approved and the Rules would have been approved. So, it's not a matter of surprise." The minister also ruled out the possibility of levying tax on agriculture. "One, it's a state subject and the Centre cannot levy such a tax." "Even as for states are concerned they can see stress in agriculture. This is hardly the time to throw out this idea. Look at the size of land holdings in India. The size of richer farmers would hardly be 1 percent." This is Very bed for present time to India farmer Economics is very bad, agriculture tax is not possible in India for present time to farmer. any subsidiary provide to Indian farmer contact for agriculture in the village & town. for the development to agriculture, Indian former is very poor in the percentage for word. Indian any men not for connected to agriculture business or farmer.